Fitting out the interior is a job that is best done before the decks go on, its easier to work with unlimited headroom and space enough to swing materials around, better light and access to the areas where the work is going on. 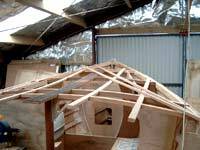 A photo from John Leathwick, looking in where the transom will be fitted soon, you can see the shaft and propellor loose fitted in the stern tube, the supports for the cockpit floor, the seat framing and the back of the engine bay. The after end of the cockpit has a big locker that reduces the cockpit volume and provides secure storage for smellys such as paint, kerosene for the stove and lights, alcohol primer, and spare gas cylinders for a little camping stove that might be used in storm conditions. John Leathwick photo. 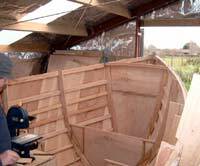 Matching plywood panels to the odd shapes inside the boat is not easy, and I’ve introduced our builder to the “tick stick” or “Jogglestick” which makes what is otherwise a hit and miss operation a lot more precise. He’s a quicker learner than he admits to, I only had to show him once! For those who want to know the trick, I’ll do an article on this for Duckworks Magazine sometime soon. Watch that space. 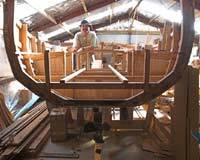 Charlie's busy putting the accommodations into his boat, and has the forepeak about done. Up in there he has a chain and anchor tackle locker between the full crash bulkhead B#1 and the watertight bulkhead at B#2. The anchor chain will lead through a naval pipe (deck fitting for chain) and down a chute to stow in the bottom of the locker in a canvas bag with a drain fitting in it so water does not accumulate, the ropes will be coiled, hanked and stowed in the lockers alongside. Forward of B#1 is accessible through a watertight plastic hatch about 28cm x 28cm opening, the intention is to stow light dry stuff that is not needed at sea, awnings and the like, in the area under the anchor well. With very long range voyaging in mind every space needs to be used, and with a relatively small boat the weights need to be in the right space. There seems to be a lot of space up here in the forward end of the empty hull, but have a look at the next pic, there are a lot of functions and storage to fit in. Big deep storage bins each side, mostly for heavy and bulky items, smaller lockers up under the decks, the big space at floor level will be home for the portable head that you see sitting on top of the lockers to port, and of course the navigation table / office. Note that there is a chain locker forward of that half bulkhead, a hanging locker just forward and to port of the galley bench, and the house battery box down low just to port of midships forward of the galley. That empty space is about as crowded as you'd want it. Each side of the forepeak is given over to bin type lockers, some with flat tops and lids and some up under the decks for light stowage and small items. 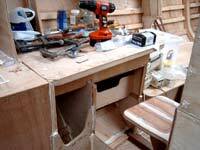 Just forward of the galley is a hanging locker for clothing, and down at cabin sole level is the house battery box. Two good sized deep cycle batteries will be stowed here, secured by webbing strops so they don’t get loose if the boat is knocked down, and they will supply all electrical needs except engine starting. Charlie has bought a Portapotti™ caravan toilet, the two tank kind with a reservoir of water to flush the bowl into a storage tank, the two parts unclip to carry away to empty one and fill the other. It’s a nice tidy unit and the price from Andrew Fink Marine RV dept. here in Hamilton was more than competitive. That Portapotti will be located on a platform in the forepeak, facing crosswise to allow access to steps up the starboard side of the lockers that will give access out through the forward hatch. There is lots of space up here, enough to get a double bunk plus heads in but as this particular boat is to be a single hander the accent is on storage and accessibility. The Navigation Station/Office iis a particularly nice space, just the right size to enable the skipper to wedge himself in securely, room for the laptop, a chart, books and all the rest to be laid out. As you read "THE BOOK" ( by Charles T Whipple, there will be one, count on it) you will be able to visualise the Author sitting in here while the boat rests in a tranquil anchorage somewhere, hammering away at his laptop composing the words that you read as you sit in your armchair. Under the chart table you can see a large tray which is chart storage, I'd guess that it will take about 40 charts if needed. There are a couple of smaller lockers under that, set back to give clearance for knees, and the tall opening is for a rubbish ( trash) sack. Its uncommon to see a decent workspace in such a small boat, and even in one as roomy as this its only the specialised singlehanded layout that will accommodate such a luxury. Nice though! This space started out as a narrow access from the main cabin to the forepeak, but with a slight change and that little folding seat its a near perfect workspace for a sailing journalist, so when you read the stories written while away on the voyage you will be able to see in your minds eye the author seated at his desk, pen in hand and hard at work. One very nice innovation that has been built into this boat, one that I did not think of, is the “Office”. 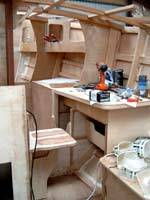 In between the galley end bench midships, and the chart table is a folding seat, and with the chart table front set back to give space for knees Charlie can sit comfortably in there with a good sized desk, lockers above and with the big bins just forward having a solid top and flush lid he has plenty of space to set up and work at his writing. There is even a space for the rubbish bag under the chart storage locker. Aft of the galley and chart table the bunk fronts and tops in the main cabin are on, good strong stuff of 9mm ply with dividers and supports underneath as is easy to put a heavy foot in the wrong place should the boat be heeled sharply while the skipper is standing in the cabin. 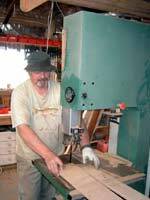 That's Charlie at my big 20inch bandsaw slicing up some more plywood, another piece marked out, cut, sanded, drilled and fitted. One less to do. The really keen of eye will see that the camber of the foredeck varies, and yes there is a reason. It is flatter forward where the hatch will be fitted, and the lower camber makes it easier to walk on. There is more camber at the after end to give adequate headroom under the deck where the "Office" is and to allow easier access when going forward. Mind your head! Right now I hear the bandsaw running, cutting pieces in preparation to fitting the cockpit floor, this is a heavy item with a big hatch to give access to the cargo hold under the cockpit aft, I’m off to see Gordon at Plywood and Marine Supplies (8F Vega Place, Mairangi Bay Industrial Estate on Aucklands North Shore) to get more plywood. Some is for the cockpit floor, some for the foredeck which is all framed up ready for planking, and some for the cockpit seats and coamings. It's coming along, parcels continue to arrive, big piles of second hand bronze fittings such as chainplates and deck fittings, a propellor, shaft and stern bearing. All cheap, so cheap that he can afford to discard half as being unsuitable and still be well on the right side of the ledger. We expect a big box of silicone bronze keelbolts from Port Townsend Foundry in the next day or so, and when they are in place will be swinging the engine up and over the gunwale to sit in place while the exhaust, fuel tanks and lines, and all the other engine stuff is positioned and fitted. I’ve got to draw the engine beds and the rest of the engine box and will have to get going so all the details are all ready for the installation.